I have a brand-spanking new site to share with you and your colleagues who might teach biology/life science. The new site is a worldwide professional network I created with the help of five super collaborators from across the country. This new public network is called: The Synapse. A SYNAPSE is a minute gap between nerve cells which transmits crucial information through the nervous system. The goal of this network is to perform a similar “synaptic” function between biology instructors of all levels and locations. The Synapse is a science content-focused site on the Ning platform. Though it is managed by six people who are all relatively well versed in educational technology, it is not the primary focus of the network. It was designed primarily as a site for life science educators to connect with others without any geographical barriers. In fact, the site owes its origin directly from a frustrating discussion in the Twittersphere between biology instructors of many levels. On that day, it was decided that we needed a central place to meet, share and support one another from afar. Here, teachers can sign in to create a free profile to begin commenting, sharing, etc. The Synapse is a professional social network that features a discussion forum, blogs, event listings, images, videos, chat, etc. This is a perfect place to troll for ideas on an upcoming unit, a new strategy or approach you’d like to attempt in the classroom, etc. On The Synapse, teachers can log requests for ideas, tips or suggestions for teaching those most challenging topics or using new strategies. Teachers will also notice the ability to join or form their own subgroups within the network based on region, content focus, instructional strategy, etc. The real potential beauty of this network is its goal of decentralized intelligence. Online social networks such as this one harness the power of asynchronous communication to allow teachers to collaborate when and where possible within our increasingly busy lives. Sure, your brain has a ton of neurons… on the order of about 10 billion. However, it also contains around 100 billion synapses. That is, connections between neurons. It could thus be said that the connections between these brain cells are in some ways a larger factor than the brain cells themselves. Play that metaphor out in terms of this project. The connections we make here are potentially larger than any of us as individuals. Experience affects efficacy when it comes to your brain. Aren’t we magnificently plastic creatures? (Check out the related discussion between Dr. Doyle & I on this post.) The fact that you could alter the structure (and thus the function) of the only brain you’ll likely ever own, is a really powerful idea. So what on Earth are you waiting for? Jump in. Become one of the collaborators (neurotransmitters) within this newly-forming network. If you aren’t one who teaches life science… forward this post to a colleague who does. They might just thank you. So welcome to another outpost on the rapidly expanding web that potentially connects professional educators worldwide. With a bit of help, this tiny outpost could turn into a metropolis. We think the infrastructure is ready. What do you think? 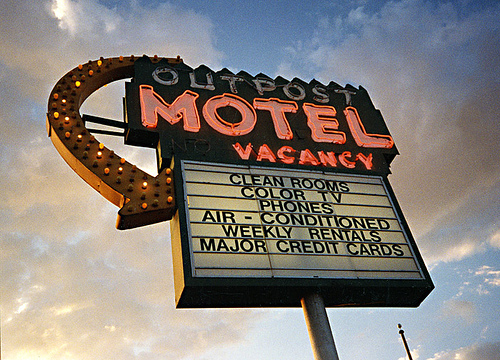 “Outpost Motel” by Allen “Roadsidepictures” on Flickr. Previous Article← Leadoff bunt in the first inning? Not this guy. Congratulations on your launch! I know you will all have great learning occur for many educators because of this site. I am excited to watch it grow! talk is filmed and availabe via YouTube. our life support system (the ocean) is deteriorating before our very eyes. It is both eloquent and challenging.